Reading and share top 12 famous quotes and sayings about Celtics by famous authors and people. Browse top 12 famous quotes and sayings about Celtics by most favorite authors. 1. "There's a tipping point that happens with soccer in which you just kinda get it. 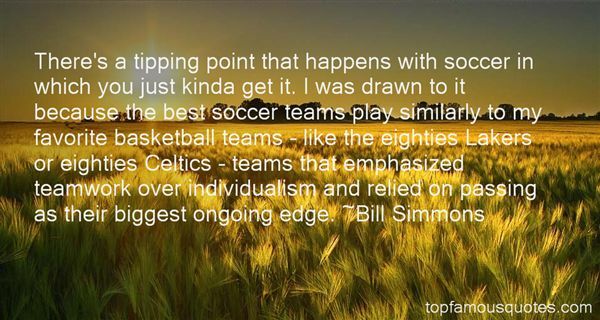 I was drawn to it because the best soccer teams play similarly to my favorite basketball teams - like the eighties Lakers or eighties Celtics - teams that emphasized teamwork over individualism and relied on passing as their biggest ongoing edge." 2. "I lived to play basketball. Growing up as a kid, Bill Russell and the Boston Celtics were my favorite team. The way they played, the teamwork, the sacrifice, the commitment, the joy, the camaraderie, the relationship with the fans." 3. "His ability to evoke Celtic pride was incredible. He would always talk about how all the old players called him up after an embarrasing performance and wanted to disassociate themselves from the Celtics. They wanted to mail in their championship rings, wanted their numbers removed from the rafters, and by this point there would be tears rolling down our cheeks and we'd want to kill." 4. 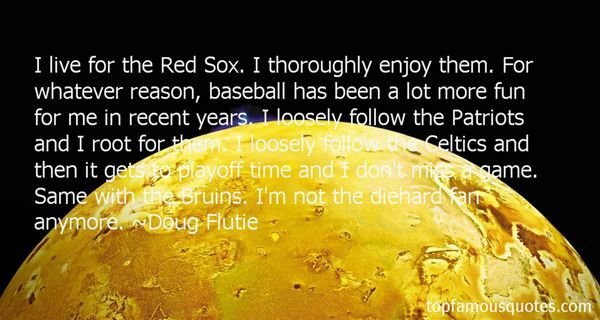 "I live for the Red Sox. I thoroughly enjoy them. For whatever reason, baseball has been a lot more fun for me in recent years. I loosely follow the Patriots and I root for them. I loosely follow the Celtics and then it gets to playoff time and I don't miss a game. Same with the Bruins. I'm not the diehard fan anymore." 5. "I don't cheer for anyone because my job is obviously more important, but the reason why I got into sports is because of my father. He's a giant sports fan and we are from New England, so he cheered for the Celtics and the Red Sox." 6. "Basketball's eras are defined by teams - Celtics, Lakers, Bulls - and baseball's epochs are defined by players - Ruth, Robinson, Mantle - but with football, it's the sideline strategists, the nutty professors and top coated Lears." 7. "When she had packed all the artifacts that made up their personal history into liquor store boxes, the house became strictly a feminine place. She stood with her hands on her hips, stoically accepting the absence of old Boston Celtics coasters and the tangle of fishing poles, the old dartboard from a Scots pub, the toolbox and downhill skis, the silky patterned ties which sat in the base of one box like a writing mass of snakes. Without these things, one tended to notice the bright eyelet curtains, the vase filled with yawning crocuses, a needlepoint pillow ... Overall, the house looked much like her apartment had eight years ago, before she had met him." 8. "The Celtics don't celebrate anything but championships." 9. "Just soaking up the history of the Boston Celtics has been the best thing that's happened to me as a player." 10. 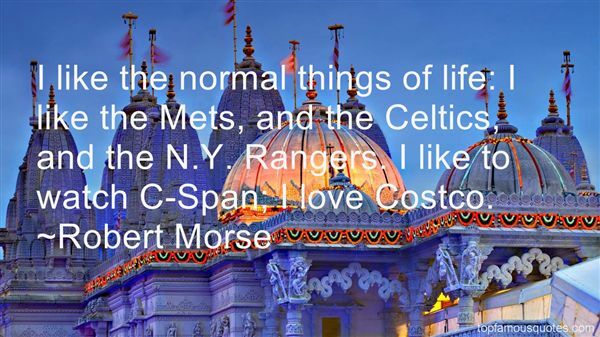 "I like the normal things of life: I like the Mets, and the Celtics, and the N.Y. Rangers. I like to watch C-Span; I love Costco." 11. "When the Knicks won the championship in 1970, our fans rallied behind us and became our sixth man because they saw a group of five distinct personalities come together and play as one seamless unit. Winning takes a game plan and that's where a great coach comes in. He has to have the vision. He has to be the architect and design a particular style of play that his players can work together and excel at. The great Celtics teams that won 11 championships in the span of 13 seasons ( 1957-69) never changed their system. They played the same game regardless of who their cast was." 12. "I guarantee you, if you could give me 10 points in all those seventh games against the Boston Celtics, instead of Bill Russell having 11 rings, I could've at least had nine or eight." I pretended to be somebody I wanted to be until finally I became that person. Or he became me."